Today’s companies are feeling pressure like never before. Global shifts in social demographics play out against a backdrop of rapid urbanisation and digital revolution. How do firms engage with companies operating in new economic centres? What does service as a commodity actually look like? This webinar will explore how these global trends impact all professional service organisations, and asks how can technology enable firms to maintain the upper hand? Specifically, the importance of relationships will be highlighted, and the question asked if technology will become the driving force behind this most human of enterprises. Join this webinar to keep up-to-date on the trends likely to make an impact on your business. Artificial intelligence has been around for a while and is already shaping the digital marketing – even if you haven’t noticed it. Every time you work with Google Ads – you are feeding in the data that informs Google’s AI enabling them to serve you with keyword suggestions, additional ad options and much more. Imagine this happening around the clock on a global scale! No wonder Google knows everything. Neuroscience has uncovered the decision-making process happening in our brain that advertisers knew very little about. Making advertisers understand how system 1 and system 2 brain works as well as their differences is like giving a video camera to someone used to drawing primitive pictures to capture and interpret the reality… It is changing the game forever – the TV, print and digital advertising will never be the same again! We are perhaps witnessing the biggest revolution in marketing since the launch of social media advertising. Blockchain is the newest kid on the block, and we are yet to see it manifesting itself in marketing but even now we can say it will go far beyond the cryptocurrency world, tokenizing and decentralizing the digital economy further. What does it all mean for you and your company? Sign up to our webinar ‘The Future of Marketing Emerging from Technology of Today: 3 things to watch closely’ to learn more about Artificial Intelligence, Neuroscience and Blockchain shaping the new marketing reality. The history of Legal CRM is an interesting one, and there has been spectacular evolution in the technology available to enhance your Client Relationship Management. Ingenious tools designed to be proactive; working tirelessly behind the scenes to intuitively serve the right information to the right people at the right time. Removing the tedious leg-work in data input & maintenance and making clever connections will make your partners truly excited about the benefits a well-designed CRM can bring. Join us for our next webinar and discover the “Golden Rules” that guarantee your investment is realising the ROI it deserves. We will get straight to the heart of the five key issues that we know from experience, need to be addressed for true CRM success! The most concerning threat in CRM projects is the continuing lack of end user adoption. That’s the greatest headache faced by organisations and the major reason why CRM fails. Mike Driver (Industry CRM Expert & Director of LogiCRM) who brings 20 years of customer relationship experience from a business perspective will share key best practice techniques and offer insights on how to successfully tackle the age-old adoption problems. 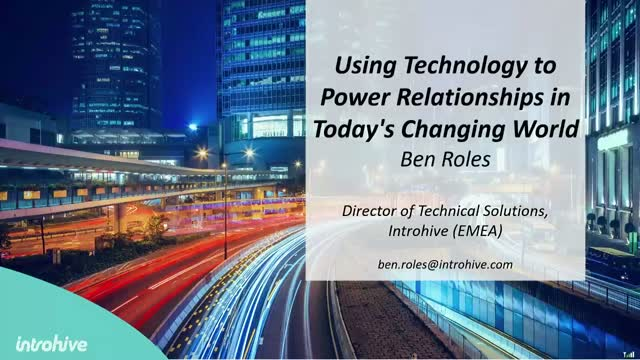 Ben Roles (Head of Technical Solutions at Introhive & experienced CRM implementation expert) will suggest pragmatic tips, effective tactics and give real-life examples of industry tried and tested best practices that have helped fill the user adoption void. Join us for an interactive and practical webinar session where the audience are also invited to come armed with their questions and pain points for the presenters to consider and advise upon. It is widely recognised that the nature of business to business selling is changing rapidly and significantly. Rising customer expectations and changing buyer behaviours, increased globalisation and commoditization pressures are combining to create a profession in flux, with organizations struggling to drive sales effectiveness and create long-term business value. During this webinar we will explore the future of business to business selling in this unpredictable environment; presenting new research in business to business sales practices and the evolving foundational behaviours that will be required to drive value and deliver competitive advantage.